This trip was to be about celebrating my first half of 100 years, but it turned out to be so much more. I knew I was strong. I knew I was adventurous, but this quest taught me to go beyond the bottom or the hardest situation. I learned I could always dig deeper and find a reserve that I never knew existed. People asked me, “Why Kilimanjaro?” Why would I want to make a trek like this for my birthday? As Everest climber, George Mallory said, “One must conquer, achieve, get to the top; one must know the end to be convinced that one can win the end – to know there’s no dream that mustn’t be dared. . .” Mountain climbing is such a perfect analogy for life itself. We struggle and strive upward. We must stop at times to rest or recalculate and then we press on again, upward. That is WHY I chose Kilimanjaro (not to mention Everest was much too cold to even consider). 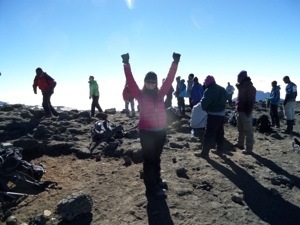 I began the journey overconfident and perhaps a wee bit unprepared for what I was about to face, after all, I had heard that 9-year-old school children could march up Kilimanjaro in their school uniforms. Sure I wanted a big adventure, but one with comfortable warm beds and someone to bring me coffee each morning. I did get one of the two. Wayne, aka Win, Winner, Weiner, or Papa Weiner. Because our first driver could not pronounce Wayne, he morphed Wayne’s name from Win, and the started calling him Weiner and Papa Weiner, in the van. Fortunately the name lasted only a day or two. Wayne is a 48 year old father of four and we soon discovered his family and ours live a parallel life. Our kids were close in age, his wife lived in the Bay Area like I did, he lived in Wichita like Kirk and many other similarities made us wonder if this chance meeting in Tanzania was somehow predestined. Sam, aka Samwell, Perfect hair, and Mountain Climbing Ken. Sam is 17, one day older than our Schrecklet, Bailey, and one of those teenaged boys every parent dreams of having. This trip was what he wanted to do with his dad for his senior year. He will forever be remembered for introducing our team to the McDonalds double with mac sauce combined with a spicy chicken sandwich. He talked about, and I’m sure dreamt about, this sandwich every day. It is what fueled him up the mountain. Justin & Bryan were interchangeable and by the second day we all agreed they could be Bill and Ted with their own “most excellent adventure.” 27 and 29 year old brothers, they had bad travel juju from the get-go. Justin arrived in Kilimanjaro airport after 11 pm the night before we were to start our climb. He was alone in the van with the driver on a very long stretch of road through a sketchy part of Arusha, when they got a flat tire. Bryan arrived in Kilimanjaro airport earlier the same night but Delta had lost one of his bags, and unfortunately it was the bag with his malaria medicine, warm coat and supplies needed for summit day. They did finally find the bag but Bryan had to pay an additional $100 to have a porter run it up three days journey to catch up with us. These two must have been placed in front of the television for too long growing up, since they knew every line to every movie targeted to teen boys and the lyrics to most punk or 80s songs. Coming from the northwest coast, these two were not lacking for oxygen…they talked and sang the entire way up. Kirk, aka Kik or Krik, or Bryan. Kirk’s name seemed to be too difficult to pronounce for most people and therefore he was either called Bryan, since they saw that on his original sign in documents, or they just didn’t say his name. Kirk was my encourager and walked behind me most of the trip. Mad Max was our fearless leader and definitely “crazy like a banana” as he said daily. Max had climbed Kilimanjaro over 300 times and we listened to everything he said. Domas & Emmanuel, our assistant guides, stepped in to help lead, carry extra water or just help me up or down an extra steep step. Gaston was the famous toilet engineer, had the nastiest job of taking down, cleaning and setting up the toilet of terror each day, and he always had a big smile on his face and led the team in our welcome song and dance each day. He had the moves. Douglas, the stomach engineer, cooked the leek soup, flat toast and fried Kili chicken we all looked forward to each day (insert a heavy dose of sarcasm). We all did a final equipment check at the hotel before loading into the van. Those of us who rented sleeping bags, poles or other needed items were given those. Wayne opened his sleeping bag and it was a rectangular Scooby Doo sleeping bag. He said it was the kind he used to tell his boy scouts NOT to bring to scout camp, and now here he was with one. We all laughed and the coordinator, Lilian assured us we would stop at “the office” to trade it for a better one. 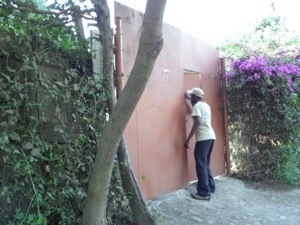 “The office” was a back alley off the main road with two large bushes for a wall and a small red metal door somehow held up between the bushes. Our driver gave the secret knock and a very tiny man wrapped in a colorful shall poked his small face out. The driver and Wayne disappeared behind the door. We weren’t sure if we were ever going to see them again. The best part was the giant gap in the bush that anyone of us could fit through right next to the magic door and yet the tiny man kept peeking his head out as if to keep an eye on us. After the “Scooby Doo sleeping bag incident” we stopped at the grocery store to pick up water and headed to the registration gate. To fuel us for the climb, we were served dry peanut butter, bread and “Medium Fat Spread” (which was what they called butter, and we learned that it would be served at every meal). The Mac-n-cheese being served to the other climbing tea, behind us looked so much better, but we choked it down and began the climb at 1pm. No need for Rosetta Stone to prepare for this trip, as we discovered we had all learned most of our needed vocabulary from The Lion King movie. Asante Sana means thank you. Hakuna Matata of course means no worry. Simba means lion and Mufasa means father. We were practically fluent! Max just liked using the little sayings he picked up along the way, like Easy Peasy Lemon Squeezy, No Way Jose, and Hotta-to-trotta (although I think he thought that meant let’s go). 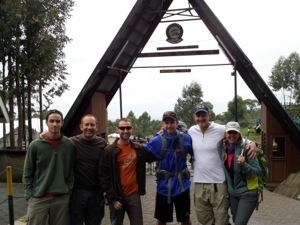 After 5 hours, 18,200 very steep slow steps (according to the Nike Fuel band), and 5,000 vertical feet, we arrived at our first camp, Machame. Everything was wet and cold. We were in the rainforest, so I guess it was to be expected. Dinner was boiled potatoes, vegetable stew and small chunks of meat. I have never been a camping kind of girl, so the whole experience of sleeping in a tent in the cold and going to a bathroom outside was something I was not looking forward to. I kept reminding myself that there was a whole industry devoted to camping. Stores like Cabelas and Bass Pro Shop were actually tourist attractions, so there must be some enjoyment to be found in this whole outdoor living somewhere. This “Barbie goes camping” panacea was soon shattered when I had to use the blue tent toilet in the dark. The tent around the little plastic potty-training sized toilet was so small, that when I had my headlamp on, I felt like I was part of the Blair Witch Project, and the whole thing just had me creeped out. It was horrifying. 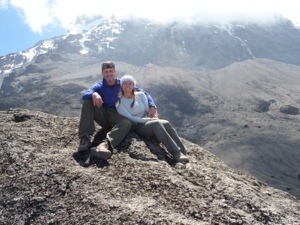 August 5- Day 2: A Kili Cold on the Mountain. We started early going up the steep and narrow traffic pathway. There are so many people climbing Kilimanjaro that we got into spots where we had to stop and wait as large groups shuffled by. 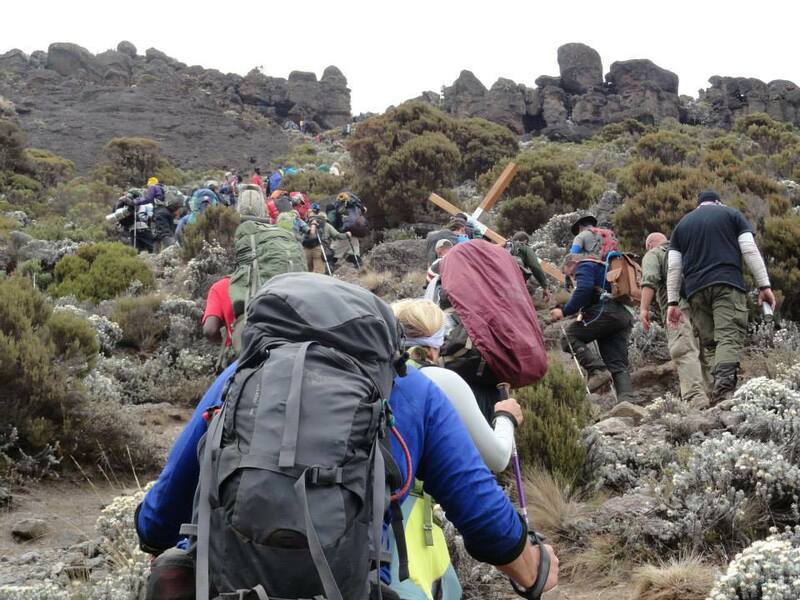 I would guess there were over 300 climbers and then 3 porters are assigned to every person, so there were over a thousand people on the mountain that morning all on the quest to the top of Africa. Somehow, Mad Max, started calling me Ginny and the other guides were calling me Queen which sounded about right. I think Max saw us sign in last night at the registration and he read Ginny and Bryan. Because of the language barrier, we just went with it. Steep but slow we made our way to Shira Hut Camp at 12,600 feet. 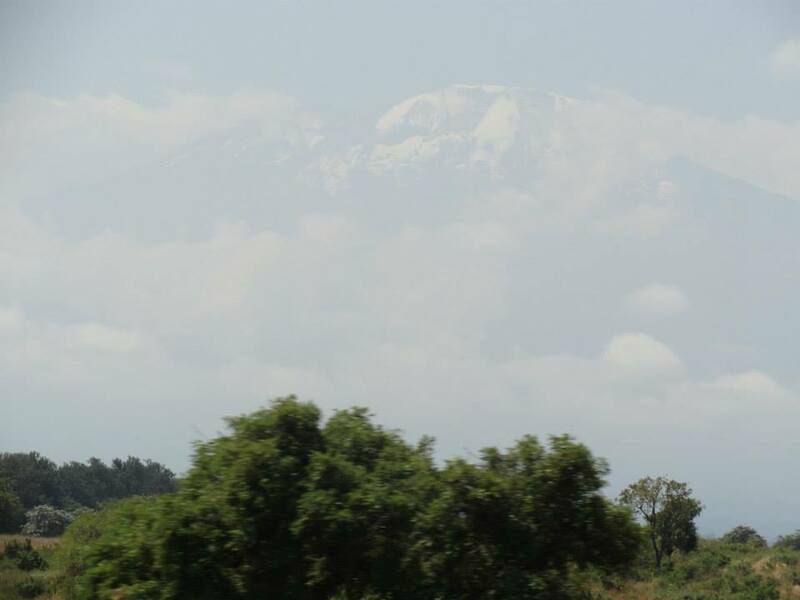 We could see Kilimanjaro in plain site. It looked even taller for here and summiting was still three days away. I was not feeling good toward the end of the day with a stuffy nose and sneezing. It felt like I was catching a cold. We arrived at camp by 1:30 and I went to sleep for a bit. Kirk brought me some macaroni and questionable fried chicken, which I did not eat. 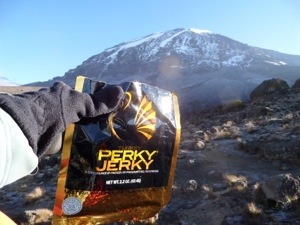 Thank goodness I came loaded with Perky Jerky packs, since this became my main source of protein and the essence of life on some days. I came out around 4 to take pictures, go register at the ranger station with the team, and eat dinner which was mostly rice for me. There was a vegetable stew to pour on top but I had no appetite. Still the hardest part is going to the bathroom– the toilet of terror still haunted me. We left Shira camp at 8:30 but not before Max and Damos made me drink a nasty cup of Ginger tea to help with my cough and congestion. Everyone stood waiting for me to finish this stinging concoction (I later learned that a spoon full of sugar made this a delight that we all looked forward to each day). I decided today to fill the large water bladder on my back with hot water and then stuff a small bladder of hot water down the front. This was a nice way to fight the chill I had early in the morning. And we were off, trekking up. Max kept saying “Polé polé” which means slowly, slowly. He didn’t have to tell me twice. I think Kirk and the other guys were getting leg cramps just trying to go this slow. Today wasn’t necessarily a hard climbing day, but it was a bit longer with a little over 8 hours of hiking. We stopped for lunch at Lava Tower which was beautiful but cold. All I could eat was Perky Jerky. When Max was saying something to “Ginny” and I didn’t reply the first time, I finally had to correct him, telling him my name was Gina. He asked “Gina?” With a confused look on his face. He then explained that the word jina meant name in Swahili. 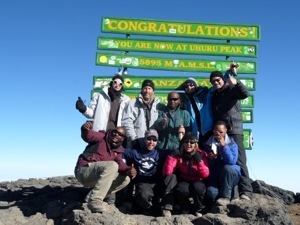 He then found it very amusing and told all of the porters who were in our group and even some from the other Climb Kili group. “Jina laco Gina” (my name is Name). I got a chill that stayed with me the rest of the night. We arrived at Barranec Hut camp at 5pm, got registered and had our snack of popcorn and nuts with tea waiting and of course they brought “more Ginger tea for jina laco Gina.” I don’t know if it was being cold and shivering all day, my back hurting from carrying my pack that was still filled with things I didn’t have the energy to dig out, or not feeling well, but tonight I finally broke. After going to the nasty toilet tent, I crawled into our tent to set up my sleeping bag and just cried. I just wanted a hot bath or shower. I want a toilet where my head didn’t touch the tent door that didn’t zip all the way. I didn’t want to have to stand in the toilet tent and pump the washer spray after using it. I didn’t want to brush my teeth with bottled water. I wanted to be home. This was all too hard. We were allowed to sleep in until 7:00am on this day, but all of the porters were up early talking and the toilet of terror was calling my name. It was too cold to want to get up and do much of anything, let alone go to the horrifying toilet tent, but I had to go. This morning was the worst. Trying to zip the zipper to the toilet tent I tore part of it and then started gagging just being in there and having an anxiety attack at the same time. The only thing that got me going was the sun had burned through the fog. We would have a beautiful sunny climb today. The trail ahead looked like a colorful snake of people all filling the trail. I learned that I liked all the traffic since it ensured a nice slow pace for us. Mad Max pointed out a giant wooden cross being carried by a group way up ahead. 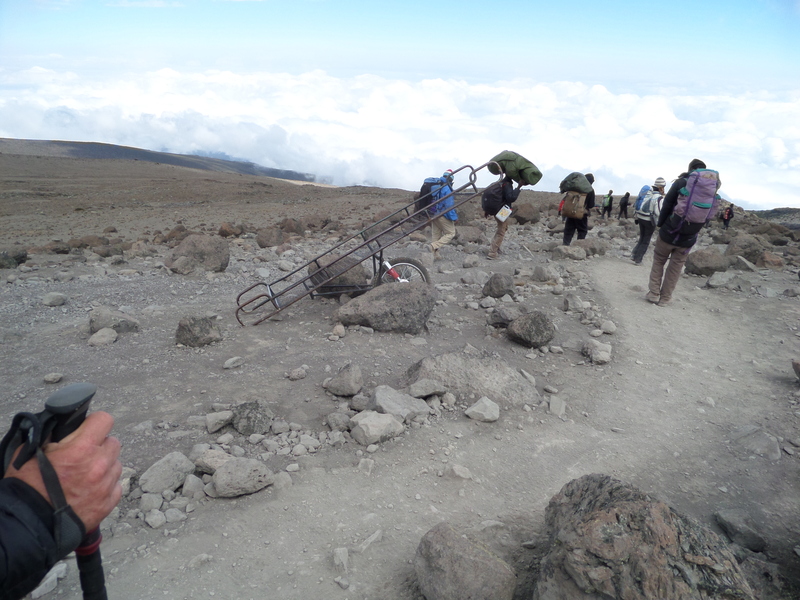 He didn’t know a whole lot more except it was another Climb Kili group and it was a group of 17 people. Mad Max said today would be an easy peesy 4-hour hike. I don’t know about easy peesy, as it was an incredibly steep boulder wall that involved grabbing hold of rocks to pull yourself up to the next foot rest. It was a fun change of pace, but definitely not easy. We were all amazed watching the porters climb this same route while carrying a 50 pound duffle on their head, pots and pans hanging from their front and a crate of eggs and a loaf bread in their free hand. They were incredible! I kept spotting the group carrying the cross ahead of us and it gave me hope. I’m back here whining about my baby backpack hurting my back and they were taking turns carrying a 12-foot wooden cross up this mountain. After all of the wonderful altitude gain, we came over a ridge and started down just as far as we had come up. It was a fine dust that had us all slipping and sliding and a couple of us falling completely, including me, causing my lips, face and even teeth to be coated in dirt. At the bottom was a beautiful river that we learned our water would be coming from tonight. We crossed over and started up, up and up. It was on this uphill that we caught up with the team carrying the cross. Their team was made up of climbers from Texas, Oklahoma, Georgia and one of the coordinators who had just spent a year in Brazil, living with a group of people there. He cut the wood in Brazil and brought it to Tanzania to make it into the cross to be carried by the group that met him there. I was too winded to ask many more questions to really understand what they were doing. 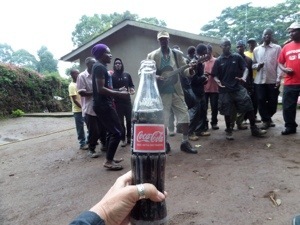 We got to our camp and were welcomed by our porters doing their nightly song and dance for us, “Kili Kilimanjaro. Hakuna matata…” I came in blew up the old air pad, set up my sleeping bag and crawled in for a nap, skipping lunch. Dinner was our usual leek soup, bread with fat spread and rice with a vegetable sauce. I ate some rice and went to bed with my hot water bottles. Aug 8 2013- Day 5: Easy Peesy Day on the Mountain. It was a steep but steady terrain and because we had to go so slowly, it was my easiest day by far. At this altitude every step was labored and small. 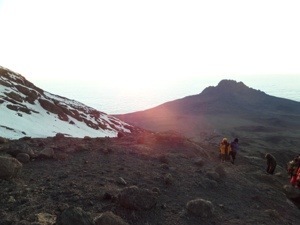 We were heading to Barafu Hut camp where we would prepare for summit night. We left our site around 9am after our breakfast of toast, egg and hotdog looking meat. The terrain was like the moon or some other planet. Just shards of shale as far as the eye could see. Justin and Bryan’s singing finally got to me. How are they not sucking air? How were they not out of movie quotes or Green Day songs? I needed focus, or peaceful bird and African drum sounds. I plugged in my headset and turned up the volume loud enough to drown them out. 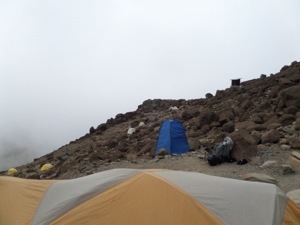 We arrived at Barafu Hut camp by 1pm where there was popcorn and cookies waiting. It started to sleet, small ice pebbles for about 30 minutes and I just went into our empty tent and laid on the mat, wishing I was laying by a pool somewhere warm. Where is the spa? We rested our legs and aching bodies for a few hours and then had our dinner of pasta noodles with a vegetable sauce. Max came in to prepare us for the night ahead. We would sleep for 3 to 4 hours and we would awake at 11 pm to start our midnight summit climb. Here we go! 11pm came very quickly considering it was freezing and damp outside. We loaded up our gear and started out at around 12:30am. I had three layers of shirts on with two coats, a balaclava (face and neck warmer) around my face, three pairs of pants, two thick pairs of socks, one pair of gloves under a pair of ski mittens. I also had hand warmers in my gloves, a hot water bottle stuffed down my jacket and warm water in the bladder on my back. The first 20 minutes was very difficult just getting out of the camp site area in the dark. I already started feeling dizzy and overheated. Kirk saw me wobbling an made me stop to shed some of my items already. I got rid of the hot water bottle down my shirt and pulled down the balaclava and tried to regulate my breathing. It was difficult even at 15,000 feet. We had 4,000 feet to climb. The coolest site was looking up at the mountain and seeing the trail spotted with headlamps. It was beautiful. I couldn’t even think of the fact we had 7 to 8 hours to reach the summit from here. I just kept my eyes on Max’s feet and took one baby step at a time. Polé Polè. Around 5:30 am Max told us to look to our right. The dawn was breaking. A gorgeous orange color was spreading across the horizon. No sun yet, just the hope of a little warmth to come. The next stretch was the most difficult. 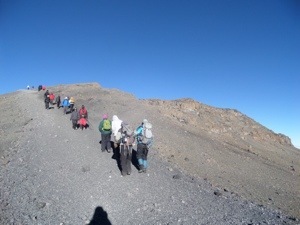 The terrain was completely loose scree, (small rocks and dust) and our steps were just 4 or 5 inches of extreme effort. Sam started experiencing altitude sickness and my body started to physically shut down (or so it seemed). Kirk kept telling me I could do it and to keep walking, but my legs wouldn’t register the words. The last hour before reaching Stella point (which as far as I can figure, is Swahili for false summit) I was crying the entire way up as tears froze to my face. I think I was crying because I felt bad going o slow, for being a wimp, for living a spoiled life, for hungry children everywhere and just about anything else I could think of to cry about at that moment. Poor Sam threw up four times. There was one point where I stopped because my gloved hands could no longer grip the poles. I was standing there just crying and thinking I physically could not take another step, when a man walked past me, looking right into my teary eyes and just said, “dig deep……dig deeper.” I had nowhere left to dig. I had just hit the bottom of my personal pit. How could he possibly understand… My hand warmer was bunched up. I was standing trying to adjust my hand warmer but could not fit my fingered gloves back into the mitten. I started to crack. Everything was just too hard and too complicated for my oxygen-deprived brain to figure out at this point. Kirk was trying to help me and I completely fell apart, crying, “it’s just too hard, I can’t even get my hand in here, it’s too hard.” Kirk pushed the glove right on. I’m sure he was trying to figure out why I was crying about my glove not going on right. When we came up over that ridge, people were celebrating and taking photos of the Stella Point sign. I was confused. It was still another 45 minutes to an hour to the actual summit. There were people who came all this way and they turned to head back down from Stella point. Were they crazy? How could you spend 5 days working toward this goal and quit 45-minutes short of reaching it? How many times in life do we do this? Perhaps you have been prepared for such a time as this. The past 5 days were to prepare us for this moment…we had to press on and finish what we came for. Our team took 10 minutes and rested as Domas broke out a thermos and 9 cups for Ginger tea, which they believe to be the cure all for pretty much any ailment. It may be just what i needed to sooth my weary soul and soften the ground to dig a bit deeper. I was able to pull myself together, emotionally and convince my body it could finish this. It was not the “easy peesy lemon squeezy” that Mad Max said it would be, but in about 45 minutes we were all on the peak of Kilimanjaro! The sun was out. The temperature was around 35-40 degrees and we all felt wonderful. 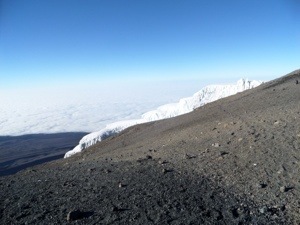 The views from atop of Kilimanjaro were spectacular. A thick blanket of clouds rested below us and the glaciers up here, although shrinking, were enormous. We snapped lots of photos before Max told us we needed to leave this altitude. Our next big challenge lied not ahead of us, but below us. I knew what went up, must come down, but we went down and down and down for what felt like an eternity. I was sure we passed a sign that read Hades about an hour into this descent. The loose scree and dust made it impossible to just step down, you had to lean back and just ski-step downhill. The only problem was the big rocks you would hit and stumble upon occasionally. After about an hour of this my legs were so fatigued that I had to stop and rest. Emmanuel grabbed my hand as if to guide and support me, but it turned out, he was just going to pull me down the mountain, as he helped to prevent me from falling. 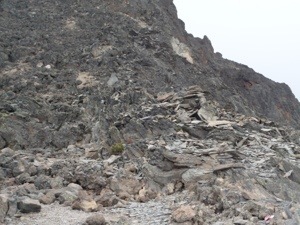 The scree ended only to be replaced be steep rock fields for another hour or two. 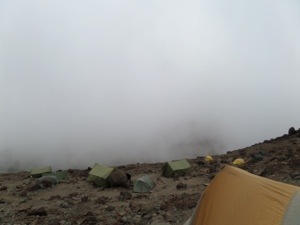 We returned to Barafu Hut campground but just for an hour rest and then we were going down four more excruciating hours. I couldn’t take it. I went into our empty tent and just collapsed on the cold floor thinking of ways to convince them I needed to be airlifted down…all the way to Tahiti. I suddenly heard “Hello, I have some juice for you,” and I lifted my head to see Benson bending down with a cup. I just placed the cup on my stomach and thanked him. He then reached in and peeled off my gators, unlaced my boots and pulled them off for me. Such a simple act of kindness that meant so much at that moment. I sat up and drank the juice. After about an hour we were saddling back up and heading down some more. Rocks, steps and scree for what seemed like days. Heading down, we passed several “Kilimanjaro Ambulances” which were basically a heavy metal framed basket with a single wheel underneath, like a very crude wheelbarrow for hauling people down the mountain. It motivated me to keep going. I do think a ride in this thing down these rocks would have every organ in your body rearranged by the time you made it to the bottom. We made it back into the rainforest and had one more cold night in the tents…with the toilet of terror. The birds are singing, the air was warmer and I was so excited to be getting back to the van that would take us to the land of milk and honey, or at least real toilets and hot showers. I did have to visit the toilet of terror one last time, but when I looked in, it was more than just terrifying, it was over stuffed and horrific. I decided it was time to put my big girl camping pants on and go into the woods behind the trees, like a man! We had our usual porridge and toast to send us on our way and by 7:30 we were on the trail heading down. On our way down, there was a break in the trees and we spotted the mountain through the clouds. It looked like a ghostly vision. Hard to believe we had just come from that peak. 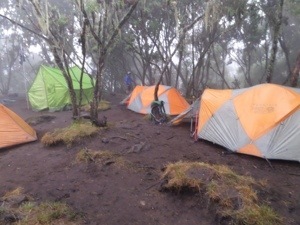 Three hours of muddy, but pretty decent trail, we reached Mweka Camp. I saw vans and heard celebratory singing. We were whisked into a little back patio reserved for “special” groups. There we were offered seats, a chance to get our boots washed (for $2 of courses) and they broke out warm beers and Coca-Colas for everyone. We all just really wanted to go to the hotel for a hot shower, but no, there was more. The African version of a Vegas Poolside singer, who reminded us of Bill Murray in shorts and a suit jacket, started strumming his guitar and singing versions of La Bamba and Guantanamera, with Swahili words. It wouldn’t end. 17, 18, 97 songs later, we got up to have a celebration meal of….you guessed it, chicken, rice and vegetables! The highlight was when Sam broke out the bag of Rolos he had been saving the entire trip to eat at the summit, but with the condition he, and everyone else for that matter, was in, he never opened them at the top. He generously shared his treasure and it was the best taste ever. We hugged all of our new friends, Douglas, Gaston, Benson, Emmanuel, Domas, goodbye and loaded up into the van with Max to head back to the LS Luxury Resort, which would be just a bit more luxurious on this night. As we were driving back to the hotel we suddenly started losing bags from the roof. At one point a bag came rolling off the top and Sam caught it with his arm out the window. We pulled into a small shop in the nearby town to get some rope or shreds of tire tread as it turned out to be, and get readjusted. All of us knew our first activity before dinner would be a hot shower, but poor Bryan and Justin’s bad string of travel luck continued and their shower only had cold water. I would have switched rooms before getting in, but they showered and shivered their way through. Wayne and Sam were heading home the next day, Bryan and Justin were catching a small flight in the morning to begin their 4 day safari in the Serengeti (I’m picturing their bags falling from the bottom of the small aircraft as they take off), and Kirk and I begin a 3 day safari starting in Terengire with our guide, Frank. Walt Disney was a true visionary, but I wonder if he ever gave thought to how many real life adventures he would ruin because they were simulated so well within the Disney parks. We arrived at Terengire area around 10am and within minutes we saw zebras, baboons, elephants, a lioness resting in the shade, and many more wild animals. Being in the Land Rover, we felt as if we were on a ride within Disney’s Wildlife Adventure Park. Frank was very experienced and spotted animals left and right, or perhaps the Disey ride had set animal markers that we were not seeing. We ate a boxed lunch at a picnic area where all of the tour groups stop to eat, and there were baboons everywhere, snatching people’s food and running. The guides would throw rocks and chase them away, but within minutes, they’d be back. One came up to a table next to where I was standing and jumped up on grabbing a woman’s lunch and nearly giving her a heart attack. As it was running off with his stolen loot, I tried to chase it and hit it with my water bottle as I hissed loudly (I think it is a primal noise I make when chasing any wild animal, since I have done the same thing to a bear at our back door at home). While lurching toward the thief, I stubbed my toe on a rock and scrapped my shin. I guess I should leave the chase scenes to the guides. The hotel we stayed in this night was called Manara Sarena. It was beautiful and again had a Disneyesque feel to it. The showers were hot and wonderful, the food was a bit more palatable and we had a lovely night there. Sometimes a day can deceive you. When there seems to be no adventure ahead, just wait. 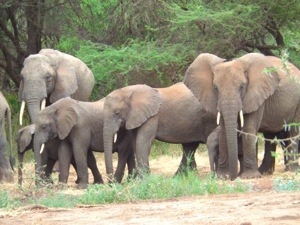 Lake Manyara was very lush forest terrain which meant it was harder to spot many animals. We found a few herds of elephant, a lone giraffe, lots of zebra and wildebeest and of course plenty of baboons. Just before giving in, we discovered a hippo pool with several hippos lounging in the sun. Lake Manyara is a famous flamingo migration spot, but this time of year we only spotted a few slackers too lazy to fly to Kenya and back. After lunch we decided to head to Ngorongoro Lodge early, And it was a good thing we did. Frank said he had never been to this lodge but was pretty sure of how to get there. After an hour of regular roads he turned up a single lane dirt road that started rising in elevation quickly and the dirt “road” became more of a goat trail. After 7 or 8 miles of this tiny got trail, and with no human life forms around, Kirk and I started saying this could not be the place. Frank kept reading from his itinerary and saying Ngorongoro Tent Lodge. I assured him we were not staying in a tent and there was no way there could be a real hotel with running water up this trail. We kept driving. Frank was starting to look concerned until we came to a small gate with a man keeping watch. They exchanged words and the gate was opened. I was praying please let there be a spot to turn around and take us to a real hotel. 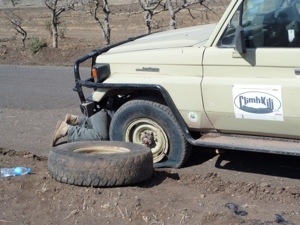 Two Maasai men carrying machetes and wearing pieces of tires on their feet, approached our car. Frank said this is it. Where? What was it? The only glimmer of hope was one of the men carried a basket with wet wash clothes and tongs to hand one to us as we reluctantly got out. Kirk said we should go check it out, I wanted assurance there were showers and flushing toilets first. 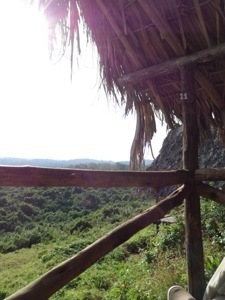 We followed the two men up a dirt road to a thatch roof hut where tables were set for dinner. There was a man behind a bar typing on a computer. 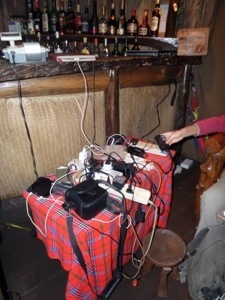 A small table in front of him had 7 power strips and what seemed like a hundred tangled cords. The man pointed to the heap and asked if we needed to charge our phones or cameras. What? Who would chance it? I thought I could already smell plastic burning. We were assured this was the right place, but I wanted to make sure Frank was not going too far away. 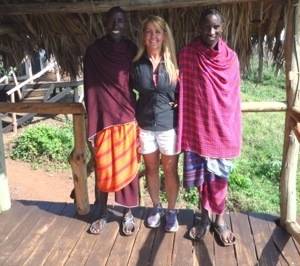 Kirk and I followed the two Maasai warrior bell hops to our hut. Suddenly it seemed very cool. Encased in mosquito nets, the hut had a queen sized bed, a small fire place, a shower and toilet and a view from the little porch that was spectacular! My first order of business was to use the toilet and when I lifted the lid, there was a huge spider clinging to the inside of the bowl! Oh my gosh, another toilet of terror. Kirk and I sat out watching the sunset over this incredible valley and realized this was the perfect spot for our last night in Africa. We were called down to the dinner tent where we would be served a Maasai meal (I had a reserve of Perky Jerky ready and waiting). Of course I brought my iPad with me to charge at the high-tech charging station while we ate! Our first course was soup followed by rice, vegetable sauce, cold pasta and chicken. I thought Kirk was going to lose it. We took a few bites, pushed the rest around the plate like an eight-year-old would do to look as if we ate more and headed back to the hut to sleep. Tomorrow we head to Ngorongoro for our last day of safari before heading home. Our guide, Frank told us that Ngorongoro Crater was one of the seven natural wonders of the world (perhaps in the African wikipedia). It is an inactive volcano that has become the habitat to elephants, lions, zebra, rhinos and many other species. 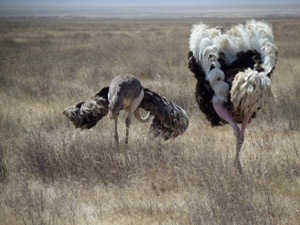 We also saw flamingos, several ostriches, and packs of hyenas. The highlight was seeing a lioness in a tree surrounded by a large herd of cape buffalo who were not going to let her come down to attack their young. 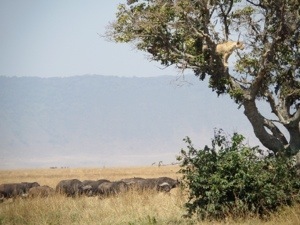 Suddenly another lioness came out of the bushes and the buffalo all charged her and chased her over to our cars. She managed to dodge the herd but those protective buffalo were not going to let her come back . Frank got word from another guide that two rhinos were spotted down by a lake, so we went on the chase to find them. They were beautiful. About this time we had to start making our way back to Arusha to grab our bags that were stored and head to the airport. Half way back we heard the dreaded flapping sound of a flat tire. 30 minutes later we were back on the road. Thanks to Frank’s skilled driving, weaving in and out of rush hour traffic at speeds that made me so nervous, I had to just look away. We made it to Kilimanjaro airport with plenty of time to spare. I made the mistake of clicking on the email icon on my phone. Hundreds of messages came flooding in, reminding me of all the work that was awaiting me upon our arrival home. How could I possibly catch up after two weeks of not checking email, phone and social media messages? I would have to dig deep! Wow! I was really looking forward to your recap and it didn’t disappoint. Thank you for such an honest tell and for sharing this inspirational (and pretty funny) true story of Barbie does Kili. I read the recap right after using the facilities and had a nice breakfast. Just the thought of having to squat in a Blair Witch contraption while eating cold pasta and using a heated bottle to stay warm really made me appreciate the comforts of home. I always thought it’d be cool to hike with you guys someday but I’ll definitely wait until you’re going to be a local Colorado trail featuring the sun, flowers and more than perky jerky for dinner. “I knew I was strong. I knew I was adventurous, but this quest taught me to go beyond the bottom or the hardest situation. I learned I could always dig deeper and find a reserve that I never knew existed.” This is what separates the average person from the rock star. Perseverance is everything. And one only knows if they have it when the critical moments arrives. Bravo and kudos Gina. Best wishes and continued success to you, Kirk and the Schrecklets. Thanks for the encouraging words! You are the rockstar!